Here is today's Giveaway! 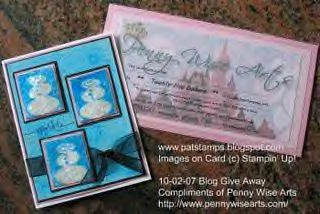 Today, Technique Junkies is giving away a $25.00 Gift Certificate to Penny Wise Arts! Suzanne Glazier from Penny Wise Arts, has been extremely generous in helping to support the TJNL's 5th year Anniversary. To be entered in today's Giveaway, you must leave a message on Pat's Blog Post by 11:59pm on Wednesday, October 3rd. Each giveaway is separate, so to be eligible for a specific item, you must enter that day's contest on the specific post on Pat's Blog. Check back every day during the month of October for the daily giveaway -- you can enter EVERY day! A fabulous Grand Prize will be offered on the last day of the month, too. Enter today -- good luck!